It all made perfect sense to me until it was mentioned that the supply curve can also be seen as a marginal cost curve. If this is the case, I don't understand why it is only sloping upwards. I know that marginal cost curves (at least at short-term) look something like... But the curve in the first diagram is different. Is is an oversimplification of a real marginal cost diagram, or am I missing something? I'll offer a less algebraic alternative to Alecos's answer. In short, yes and no. 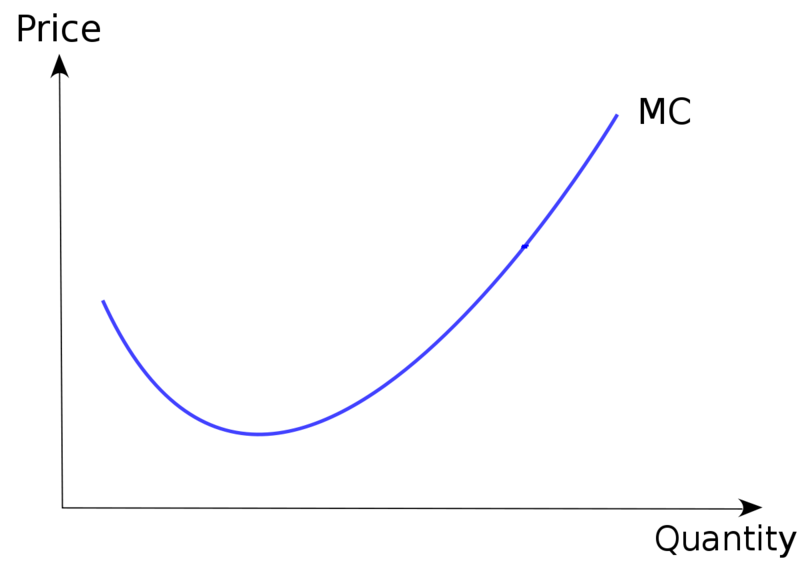 Normally the MC and AC curves would look like the following, with MC intersecting AC from below AC's minimum point. Suppose price $P_0$ were below this point. Then the firm would sell at a quantity below $Q_1$. But what does this imply for the firm's profit? On average, the firm would make $P_0$ per unit sold, but the cost per unit must be higher than $P_0$, i.e. at $AC_0$ if the firm is selling at $Q_0$. This means the firm would be making a loss (negative profit) and no profit maximizing firm would try to operate at this point; they'd be better off shutting down and get zero profit instead. 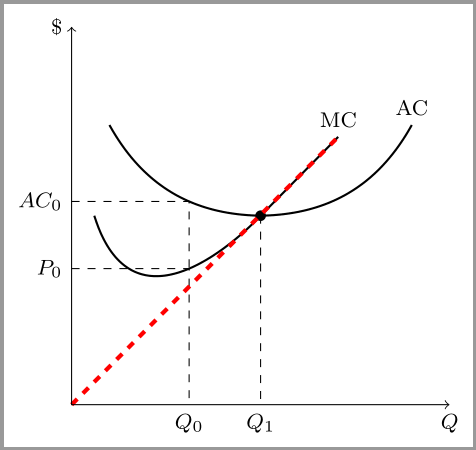 Therefore, a firm's supply curve should be the fraction of its MC curve that's above the AC curve, which is always upward sloping. The quantity $Q_1$ where a firm would start producing is sometimes referred to as the minimum efficient scale of production. 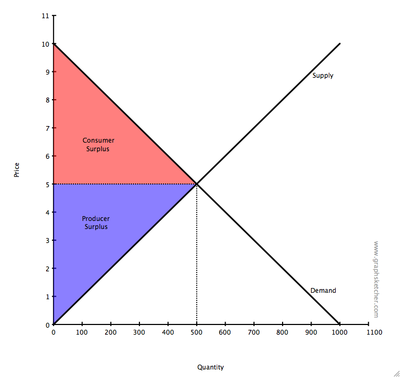 In your demand-supply diagram, the supply curve starts from the origin. Imagine this is just as having the red-dash line in the following diagram "approximating" the part of the MC curve that is below AC --- filling the gap, so to speak. You are missing the average cost curve in the same diagram. Basic algebra gives us the following. For this to be equal to zero, we must have $MC \cdot Q = C \implies MC = AC$. So when $AC$ is at its minimum, it equals $MC$. But we also want the second order condition, and we want the second derivative to be positive, evaluated at the critical point. So at the point where $MC = AC$ we want MC to be rising. But this implies that it will cross the $AC$ curve from below. In turn this implies that for quantities lower than this point, marginal cost curve will be below the average cost curve, which means that if this left part of $MC$ curve was a supply curve the firm would have losses. Therefore the supply curve is only an upwards-sloping part of the marginal cost curve. You can now superimpose the $AC$ curve that is consistent with all these. Not the answer you're looking for? Browse other questions tagged cost marginal or ask your own question.